Forgive my harping on this, but I keep hearing about how powerful social media is for gathering insights from the IT communities and users. Yet I rarely see actual market research conducted via the social media milieu. So now's the time to fully test the process. I'm hoping that you users and specifiers of enterprise software middleware, SOA infrastructure, integration middleware, and enterprise service buses (ESBs) will take 5 minutes and fill out my BriefingsDirect survey. We'll share the results via this blog in a few weeks. We're seeking to uncover the latest trends in actual usage and perceptions around these SOA technologies -- both open source and commercial. How middleware products -- like ESBs -- are used is not supposed to change rapidly. Enterprises typically choose and deploy integration software infrastructure slowly and deliberately, and they don't often change course without good reason. But the last few years have proven an exception. Middleware products and brands have shifted more rapidly than ever before. Vendors have consolidated, product lines have merged. Users have had to grapple with new and dynamic requirements. Open source offerings have swiftly matured, and in many cases advanced capabilities beyond the commercial space. Interest in SOA is now shared with anticipation of cloud computing approaches and needs. So how do enterprise IT leaders and planners view the middleware and SOA landscape after a period of adjustment -- including the roughest global recession in more than 60 years? 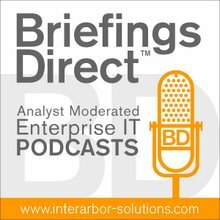 This brief survey, distributed by BriefingsDirect for Interarbor Solutions, is designed to gauge the latest perceptions and patterns of use and updated requirements for middleware products and capabilities. Please take a few moments and share your preferences on enterprise middleware software. Thank you. Speaking of SOA: Are services nouns or verbs?